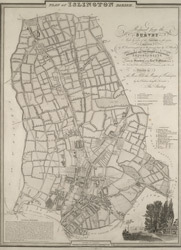 This detailed plan of the parish of Islington records each property and field boundary and even indicates the layout of the gardens and trees. A vignette in the lower right corner shows a view of Canonbury from 1821. The note at lower left reports the increase in building over the last seven years and the population growth.